– We, Musiklärarnas Riksförening, wonder if you would like to tell us a little about how conditions are for teachers in your country? It is a large school with more than 2,100 students, and over 200 faculties. Students come from all around the world, representing 76 nationalities! – How many lessons per week do music teachers have? – In the Elementary school, there are 4 music teachers. Each teacher has around 23 or 24 classes to teach each week. We see each class twice in a week, so students receive music class two times each week. The lessons are 40 minutes. Each day, teachers will teach from 4 to 6 lessons. We are given between 2 to 4 free periods for planning each day….we are VERY lucky in this regard! Most schools are not this generous, especially back in the USA! – Classes are in average 22 students. – And how many music lessons do pupils have per week? – What about the musical equipment in classrooms? – We are very fortunate to have a wide range of resources at our fingertips! Each classroom has an extensive “orffatorium”, offering Orff instruments such as xylophones, metallophones, glockenspiels, hand drums, and other non-pitched percussion instruments. We also have music stands for reading music. The older older students start learning flute recorder in 4th grade, however they purchase their own instrument (roughly $5 USD). We use recorder as a tool to read music on the staff. – How much do teachers earn per year? – Salary is configured on a step system. Each year, staff can go higher in pay. Some conditions such as number years of experience can affect the entry or start pay. Base pay without experience is $40,800 USD. The highest pay step is step 22, which is equal to $80,400 USD. – Other conditions you would like to tell us about? – Our calendar year is 180 teaching days starting in mid August, and ending in mid-June. We have a 2 week winter break near Christmas, a week near Easter, plus an Autumn break usually near the end of September. We have a unique collaboration time built into our weekly schedule. Every Tuesday, students are released at lunch time (12:30pm) and the afternoon is set-aside for teachers to collaborate and plan units. It’s also time for committees to meet, as well as team leaders and faculty meetings. 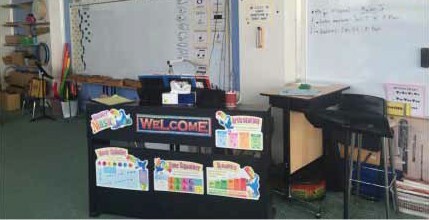 Teachers are required to teach an After School Activity session of their choosing. This could be teaching students how to play chess, painting, dancing, kite making, rockets, knitting, etc.. The sky is the limit. This is part of our teaching contract. – We would also appreciate your description of your your educational background. – I graduated from North Park University in 2003 with a degree in Music Education, along with a BA in Spanish. I am certified to teach music from Kindergarten through 12th grade. I also am certified in Orff-Schulwerk, levels I and II. In 2013, I graduated with a Masters of Music Education from Vander- Cook College of Music in Chicago. During my time at VanderCook, I specialized in String Orchestra education (with an emphasis in conducting) and General Music Methods. – Perhaps it would be a good idea if you described your “school history”, telling us in what different ways you have met with music education? – After graduating college, I began teaching immediately at a public school in Chicago. I taught grades 5-8 general music from August 2003-June 2008. While living in Chicago, I also worked with and conducted a youth orchestra called “All-City Youth Orchestra”. It met once a week for rehearsals, and was made up of students all across the city of Chicago. Later, in 2008, I moved to Doha, Qatar with my husband. He won a job playing principal oboe in the Qatar Philharmonic Orchestra. The first year in Doha, I taught at another international school, Qatar Academy. Then the following year (2009), I was hired full time at the American School of Doha, and have been there ever since!